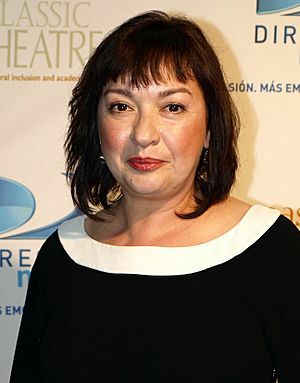 Elizabeth Peña (September 23, 1959 – October 14, 2014) was an Cuban-American actress and television director. She was known for her roles in The Incredibles, Rush Hour, Jacob's Ladder, and La Bamba. She was born in Elizabeth, New Jersey. Peña died at the age of 55 on October 14, 2014 at Cedars-Sinai Medical Center in Los Angeles, California from cirrhosis of the liver. Elizabeth Peña Facts for Kids. Kiddle Encyclopedia.